1. How many times did Peter think he should forgive someone else? 2. Did Jesus agree with Peter? 3. What did the king do to the servant who owed him 10,000 bags of gold? a) He took pity on him, cancelled the debt and let him go. b) He sold the man and his family as slaves. 4. 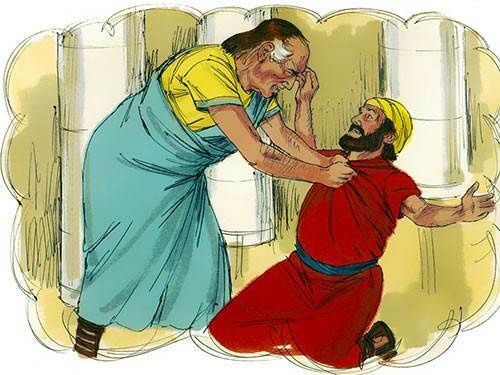 What did this servant do to his fellow servant who owed him a small amount of money? a) He forgave him and cancelled the debt. b) He put the fellow servant in prison. 5. Why was the king angry with the first servant? a) The servant did not show mercy to his fellow servant even though he had received much mercy from the king. b) The servant was ungrateful and did not thank the king.